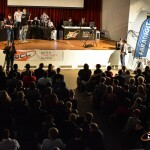 In 2012/2013 I organized the first Dutch StarCraft League, an open e-sports (electronic sports) tournament focused primarily on the Dutch scene. Well over 50 volunteers and many sponsors have stepped in to help, and around 300 players, foreign and domestic, participated in the tournament. The finals were held offline at the World Forum in The Hague, images of that can be found here, videos of the matches are here. I’ve established the ‘Stichting E-sports Nederland’ which will continue to promote e-sports in the Netherlands over the coming years.